It’s days like today where ad-libbing WAM doesn’t pay off. *bangs head* It just did not want to be written. I must have a vendetta against sleep. It’s the only explanation for why I’m posting WAM in color at 12:41 AM on Thursday. First comment? COOL! I love seeing the comics materialize. I wonder what it will look like tomorrow. And have I said how much I love Gawain/Hagen? Because I really, really do. Though in the fourth panel maybe you want to leave off ‘it’ because it would work for the accent you’d been using. I really like the idea of Gawain flying-tackling Doc Galen in the seventh panel. It seems he still has his guts (and rhyming parts) intact. Cute idea with the fleeing silhouettes as a final panel/footnote, too! For a instant-write comic that frustrated your goals, this turned out quite well, Liliy. Heh heh. Even when he is wounded, Gawain can be a physical threat. 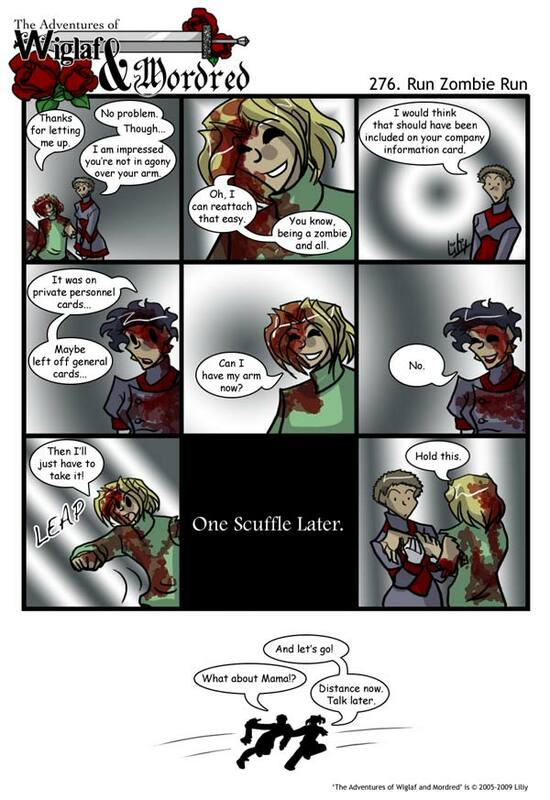 XD Good thing he retrieved his arm. For an ad-libbed edition, Liliy made this strip real cute. The various expressions on Galen, Gawain and Hagen are all very well-done, and the silhouettes were a great idea. Galen is out like a light. Gawain has quite a right hook. This strip made me laugh out loud. Brilliant.